In the Star Trek fictional universe, habitable Earth-like planets are designated as Class M planets, where M stands for the Vulcan word Minshara. In the real universe such planets would also be known as class M, but for different reasons.For exoplanets, we can currently only estimate their potential habitability by broad physical properties such as mass, size, and possible temperature. It’s difficult to determine the temperature of an exoplanet, since so many factors can come into play. If Mars were at the orbit of Earth, it would still be cold and hostile. If Venus were at Earth distance it would still be hot and inhospitable. But we can broadly categorize temperature by the amount of radiant energy it receives from its star. From this we can group planets by temperature into class-p psychroplanets (cold), class-t thermoplanets (hot) and class-m mesoplanets (medium). Earth is therefore a class m planet, since it is in the “goldilocks zone” for our Sun, but then so are Venus and Mars. We can also categorize exoplanets by their size or mass by how they compare to known planets. Thus we can have mercurian, subterran (Venus and Mars), terran, superterran (super Earths), neptunian (small gas giants), and jovian (Jupiter-like). It’s generally thought that only the terran classes would be of sufficient mass to have an Earth-like atmosphere, but it’s also possible that larger planets might have a terran-massed moon. The holy grail of exoplanet hunters is to find an Earth-massed planet in the goldilocks zone of a Sun-like star. We haven’t found one yet, but we’re getting closer. 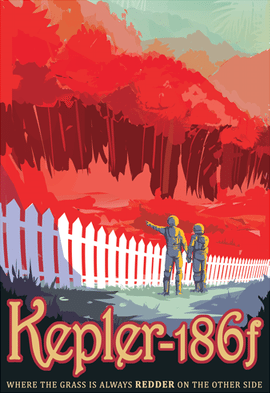 Early last year it was announced that we’d discovered the most Earth-like planet so far, known as Kepler-186f. It was found to be only about 10% larger than Earth and in its star’s habitable zone. The big downside is that it orbits a red dwarf. Red dwarf stars tend to have strong flares and stellar wind, which would act to strip closer planets of their atmosphere. They also tend to be much hotter in their youth, only later cooling down to their reddish orange hue. So it’s very possible that even Earth-sized planets in a red dwarf’s goldilocks zone would be far from habitable. This week at the AAS meeting the Kepler team added 554 exoplanets to the confirmed list, including 3 new “Earth-like” worlds. Earth-like in this case simply means they are less than twice Earth size and in the theoretical habitable zone of their star. Of these Kepler-438b is now considered the most Earth-like exoplanet. It is only about 12% larger than Earth and gets about 40% more heat from its star than Earth does from the Sun. All three of these new planets orbit red dwarf stars, and not Sun-like stars. That’s not surprising given that it is much easier to find larger planets around smaller stars than the other way around. But this new announcement shows that we’re getting closer to the holy grail of a truly Earth-like exoplanet. Given the known distribution of exoplanets, there are likely 8 to 20 billion of them in the Milky Way. We’re actually closer to finding the “Holy Grail” of an Earth-size planet in an Earth-like orbit around a Sun-like star than you may think! While the news has been dominated by the discovery of the 8 new planets you discuss here, there was also the announcement of a pair of Kepler planet candidates orbiting inside the HZ of two more Sun-like stars. While their planetary nature still requires confirmation (unlike these 8 planets whose planetary status has been verified), KOI 2194.03 and KOI 5737.01 provide a foretaste of the Kepler discoveries yet to come.